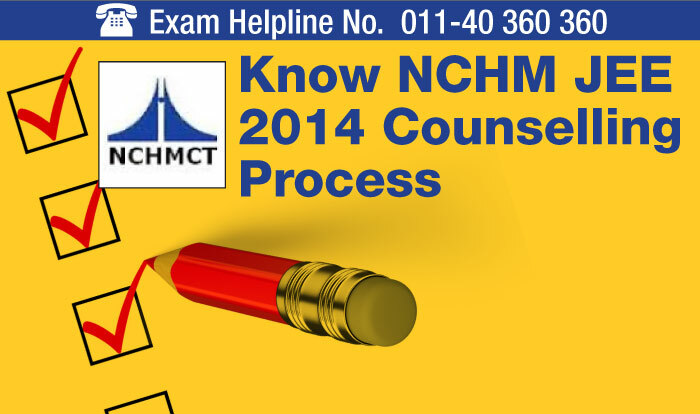 NCHM JEE 2014 Counselling - Online registration and choice filling of NCHM JEE 2014 counselling process began from May 26, 2014. The result of NCHM Joint Entrance Examination, an all India level competitive hotel management entrance examination, was declared on May 13, 2014. Comprising important events like mandatory online registration and choice filling, mock counseling, the three-round NCHM JEE 2014 Counselling process will end on July 10, 2014. Counselling process are conducted to offer admission to candidates at any one of fifty-two participating hotel management institutes located in different Indian states. For the current academic year 21600 candidates registered for the NCHM JEE 2014 written exam which was held on April 26, 2014. The qualified candidates will be able to participate in web based counselling process through internet from any place of their convenience. Candidates can also approach any of the Govt. Institute of Hotel Management to participate in online registration and choice filling from May 26, 2014 to June 13, 2014. Those who will not be able to participate in the 1st and 2nd round will be able to participate in the Third Round where only the Spot Counselling is allowed. Candidates are permitted to change choice of Institutes during Second Round of Counselling through internet (online). What the session holds for eligible candidates? Registered candidates are required to exercise their choices of institutes in order of their preference. The procedure for exercising choices and other important information will be guided through appropriate messages and tabs on the computer screen. Candidates will be displayed information like availability of seat at preferred IHM as per their rank and score. Candidates can fill in as many numbers of choices in the order of preference from the list of available seats in the listed IHMs. After First Round of Counselling is over, candidates are allowed to change their allotted IHM (in first counseling round). To alter the allotted IHM, candidates are required to pt for better choice of Institute during Second Round of Counselling. If candidates are awarded with another Institute of Hotel Management during Second Round of Counselling, the earlier allotted seat to them will be automatically cancelled. During online registration process candidates are not allowed to change category and other credentials mentioned by them on the NCHM JEE 2014 Application form. Candidates are not restricted to update their personal information while enrolling for online registration process. Mock Counselling is conducted to accustom candidates about online counseling and enables candidates to view probability of seat allotment as per their All India Rank and IHM preferred by them. It has to be noted that seat allotted during Mock Counselling is not final decision of the exam conducting authority NCHMCT. All registered candidates should fill their choices of institutes and lock the choices from within prescribed deadline. After the choices/names of finalized IHM are locked, candidates will not be able to change their choices any further. On successful completion of locking procedure, candidates are required to take a print out of the locked choices, (which also contains terms and conditions). The print out has to carried to the Admission Center. Seat allotment is done based on the candidate’s All India Rank (AIR), category, preference of choices and availability of desired seats. The seat allotment results will be available online on the NCHMCT website. There is no provision of sending Individual allotment letters to the candidates by post. Candidates who are allotted seats will have to personally report to any one of the Admission Centers. All successful candidates, who have been allotted a seat, are required to report to given Admission Centre or may report to any one of the Admission Centre and produce all the relevant certificates in original for verification and a signed printout of locked choices and also bring a single Demand Draft of Rs. 44250/- at the time of reporting. The demand draft should be drawn in favor of “NCHMCT”, payable at Noida or Delhi. Candidates have to report at the Admission Center (ACs) fordocuments verification, initial fee payment, and to collect the provisional admission letter. The Provisional Admission Lettermentions seat allotment details of Institute, personal data of candidate, fee paid and other details. Deadlines for remote admission at Admission Centre after 1st round of allotment are June 17-21, 2014 and June 23, 2014 till 5:00 pm. No fresh registrations would be allowed in the 2nd round of counselling. Only the candidates who have registered in the 1st round will be eligible in this round of counselling. Eligible candidates could be allowed to modify their earlier submitted choices, if they desire. Otherwise earlier submitted choices would be considered for seat allotment automatically by the system. Deadline for remote admission at Admission Centre (Fresh allotte only) after 2nd round of seat allotment is from June 30, 2014 to July3, 2014. There will be third and last round of SPOT round of Counsellig round, in which Candidates, who did not register during main Counselling (absentees) and Candidates who got the seat allotment but not reported at admission centre, are allowed to participate. Spot counseling process also involves the must to be done online registration and choice filling process. Earlier registration and filled choices will be treated invalid during spot counseling round. Candidates are required to report to any of the Admission Centre on specific day in person for SPOT round Counselling. After the completion of “Choice filling and locking”process, candidates will be provided with a document mentioning verification status, DD details and locked choices details. Candidates who have deposited fee earlier and not withdrawn are not required to bring new DD. During choice submission, all the choices will be shown to the candidate irrespective whether seat is available or not. Candidates, who have taken provisional admission in Spot Round of seat allotments, have to report at their allotted Institute and submit their preference for hostel accommodation. Hostel allotment process will start after 3rd round of counseling. Candidates who opted for “hostel accommodation” will be only considered for hostel allotment. Candidates can cancel their allotted seat by submittinga declaration as per the predefined formatat Admission Centre. The fee shall be refunded through DD. The refund amount will depend on number of classes attended by the candidates at their allotted institute.